Bill Bell is the foremost illustrator of ceramics by the Franklin Mint, and the launch of his first books is a publishing landmark. 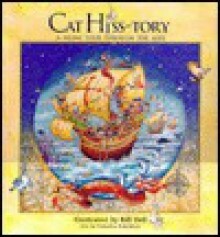 Cat Hiss-tory is an imaginative and humorous book that is a journey through history from the feline point of view. From cats of the ancient world building the Great Wall to heroic cats racing chariots in Imperial Rome to the first modern cat to walk on the moon, Bill Bell, "the world's most collected artist," presents a charming book of feline nostalgia and nonsense that delights the imagination. His fanciful Cat Hiss-tory is a great new book for adult collectors and children alike!